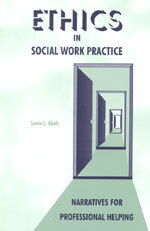 The narratives in this book are personal stories about ethical experiences in social work practice. Each narrative reveals situations that will help your understanding of the broad array of ethical decisions that social workers encounter in their work. You will see how cultural backgrounds and personal experiences reflect values and beliefs and influence thinking and decisions social workers must make about ethics. This book offers new ways to examine ethical concerns through the experiences of those directly involved in the process and proposes a methodology for grounding professional decisions. Each narrative can aid social workers and others to consider the best method to resolve ethical conflicts. A special exercise at the end of the book allows students to expand their visions of ethical practice.